As time moves on and technology improves you will not be surprised to find that now your traditional window blinds can now be motorised. Whether you opt for a simple up and down remote for a roller blind to a whole house automated and controlled from a series of programs set from the other side of the world there will always be an answer to suit everyone. No longer does the question of ‘would you like to motorise that blind?’ come with advice of sitting down before receiving the price as a it can be done FROM AS LITTLE AS £20 on top of the price of the chosen blind. With our continued commitment to making all blinds child safe and the legislation for fitting these products coming in to place a few years ago, we believe the best way to do this is with a motorised version of your chosen blind. Opting for this removes the need for any chains and cords which have traditionally been used to operate the product. A simple plastic wand with a small two buttoned remote known as the ‘Magic Wand’ can hang on either side of a roller blind to allow a basic up and down control as shown in the picture below. Fitted at either side of the blind to allow best access its ideal for a children’s room. This option comes with a thin round battery pack which is fitted behind the blind ideally so it is not seen or connected to the cassette if this option is chosen for the blind. 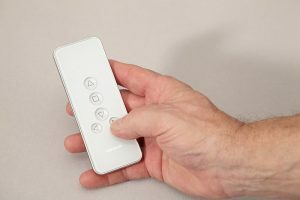 If getting to the blind is a problem or you would just simply like to control it from the comfort of your armchair then possibly the ‘One Touch Remote’ is the answer for you. 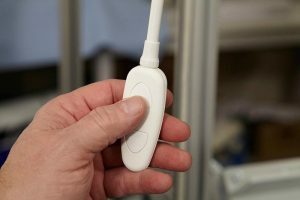 Very similar motorisation idea to the Magic Wand with the added bonus of having the remote available to move around the house leaving only a small receiver wire on the blind itself. On top of this with the introduction of the 14 channel handset, you could control 14 separate blinds within your house from the one remote. Who doesn’t want to wake their teenage kids up on a school morning without having to get out of bed themselves? This option comes with a rechargeable battery within the motor which simply has a mobile phone style charger plugged into it to charge for 4-5 hours. A typical full charge of the battery would last 5 months depending on the use it gets on a daily basis. One of the world’s leading motorisation companies that produce systems for Blinds and Curtains is Somfy. They have many years’ experience and have therefore over time developed many systems that can allow the user to operate a simple up and down roller blind to a series of blinds controlled by timers, sun sensors and wind sensors. Timers can give the illusion that someone is at home and using the products when they are in fact on holiday or just somebody who returns after sunset from work. The built-in flexibility of times makes sure that it provides a varied closing time so as not to become too predictable. It can also track the changing sunrise and sunset times so you don’t have to change the settings ever month to suit the time of year. Sun and wind sensors can monitor and control the blinds given the current conditions. Examples of this being useful would be for awnings as they are prone to damage if extended during windy days. The wind sensor would detect this rise in the wind gusts and bring the awning in to avoid damage. 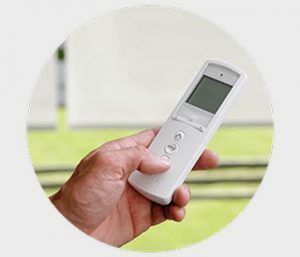 Remote controls as standard with this system but a choice of battery power, plug into the mains or hard wired into a fused spur give the user more options and choices. The benefit of each will vary from one person to the next but the mains power would require no maintenance to charge or change batteries whereas the battery system would still work during power cuts and also be able to be installed in areas where getting mains power is tricky. 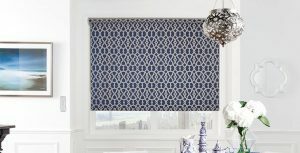 All your new blinds can be added to a network controlled from your smart phone or tablet. Once added you can simply raise and lower the blind as you wish with your finger tip or why not set times of the day you want each blind to be in a certain position and it will do it for you. So for example, if you are on holiday for a week your blinds will still open at sunrise and close again just before it gets dark adding the perfect illusion that the house is occupied. Users can also set ‘scenes’ where by you can tap a certain icon on your smartphone or tablet such as ‘movie night’ and all of the living room blackout blinds will close to create the perfect cinema room. 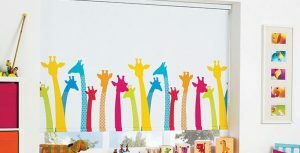 Or maybe not so popular with the teenage kids but ‘wake up for school’ a simple tap can have all your kids blinds open to wake them up…. The options are endless. 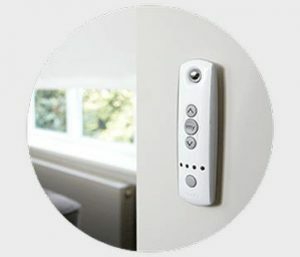 The Pebble control is also available on the Powerview system which is basically a remote control with various raise and lower options but without the access to the main set up, the idea if you want to let your children operate their own blinds but not anywhere else. We also offer all are above blinds on the Connexoon system through the home automation system Somfy known as TaHoma. This allows not only full control of your window shades but also to combine them with other parts of your home such as lighting, security cameras, heating thermostats and many more. Having all these controlled through one system reduces the number of set ups required and also has all the power in one app for you to use.